China will be on vacation next Monday and Tuesday for the Labor Day Holiday. If you happen to be in Beijing on Saturday, be aware that authorities are warning evening rush hour traffic will be the worst of the year. Chinese President Xi Jinping continues to emphasize the need for China to cut reliance on foreign technology. Why it matters: China has had programs for decades to develop indigenous technologies, but the focus is rapidly intensifying as the U.S. puts more pressure on China. 1. Xi chaired a national conference on the "work of cybersecurity and informatization" last weekend. Per Xinhua, he stressed that China will inject more resources into research, industrial development and policy making in order to achieve breakthroughs in information technologies. Quote"In the past we tightened our belts, gritted our teeth, and built the two [atomic and hydrogen] bombs and a satellite...In the next step of tackling technology, we must cast aside illusions and rely on ourselves." The threat: The recent U.S. sanctions that may cripple ZTE, a new Department of Justice investigation of Huawei that could lead to similar sanctions, and what appears to be a broader Trump administration strategy to thwart China’s technology ambitions could make a U.S.-China technology war run much hotter than the overall conflict over trade. Technology CEOs the world over with supply chain dependencies in China should be increasingly nervous and focused on their firms' efforts to have viable contingency plans for a U.S.-China technology cold war. "There are very few technologies where we still have a monopoly, and though it is in our national interest to prevent exports that improve China’s technological base, we should not delude ourselves that this will frustrate Chinese ambitions. At best it may slow them ... China may not retaliate directly or immediately, as it still needs some U.S. technology for mobile phones, but it will not allow ZTE to go under. Foreign suppliers will offer ZTE substitute goods if they make them and look to build substitutes if they do not." Why it matters: Made in China 2025 goes to the heart of the growing US-China technology war. It was never reasonable to expect China to modify a plan it sees as vital to achieving its goal of National Rejuvenation, and given the renewed public emphasis from Xi on developing indigenous core technologies it is even less likely there will be a breakthrough in the US-China trade disputes, unless President Trump decides to take a lesser deal, declare victory, and move on. The cybersecurity conference mentioned above was important to further China's agenda to become what it calls an “Internet Superpower." "Xi urged improving the governance capacity in cyberspace and developing a governing network led by the Party." "Internet media should spread positive information, uphold the correct political direction, and guide public opinion and values towards the right direction." "Internet service providers should take responsibility to prevent cyberspace from degrading into a platform full of harmful, false, and provocative information". "Efforts should be made to enhance self-discipline of the internet industry, and mobilize all sectors to take an active part in cyberspace governance". 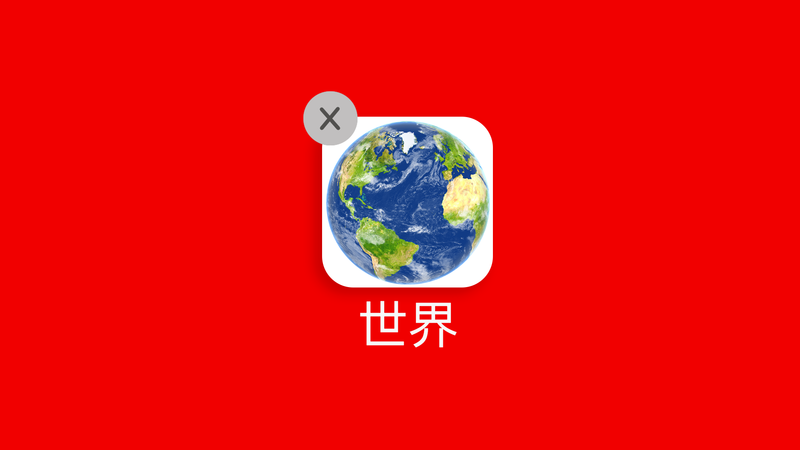 "Xi said it is a general trend and common aspiration of the people to promote the reform of the global cyberspace governance system by sticking to a multilateral approach with multi-party participation from the government, international organizations, internet enterprises, technology communities, non-governmental institutions, and individuals." "Cyberspace governance under the framework of the United Nations should be advanced and non-state entities should play a better role, he said." Quick take: As robust as China’s internet controls may be, the party clearly does not think they are tough enough. Given the scandals in the West over fake news and the use of Facebook and Twitter to influence elections, expect more countries to welcome China’s approach to cyber governance. Axios' Erica Pandey writes: Chinese President Xi Jinping and Indian Prime Minister Narendra Modi will have one big goal for their summit today — dial down the tensions in a relationship that's full of them. The big picture: As China ramps up its investments in South Asia through its trillion-dollar Belt and Road Initiative, India feels increasingly encircled — and threatened. India sees itself as China's equal, but Beijing doesn't see it that way at all. That makes cooperation difficult. The Politburo met twice in the last week. The first meeting excited investors as some interpreted official comments on the meeting as a sign a new round of economic stimulus is coming. The second meeting, was a Politburo Study session Xi chaired on Marx and Engel's "The Communist Manifesto”. The purpose of reviewing the Communist Manifesto is to understand and grasp the power of the truth of Marxism and write a new chapter of socialism with Chinese characteristics in the new era, Xi said. More efforts should be made to develop Marxism in the 21st century and in contemporary China, and write a new chapter of adapting Marxism to the Chinese context, Xi said. My thought bubble: The contemporary PRC brand of Marxism and Communism is far removed from the original visions, but the CCP believes it has the right, the power and ability to evolve those ideas to fit the times, an effort led by a cadre of theoretical gymnasts who would put Nadia Comăneci to shame. The big picture: Doubling down on Marxism is a means to an end for the Party, but that does not also mean that Xi himself is not an ardent Marxist whose fervor is only increasing as he sees a world evolving and fracturing in ways that would stir the loins of any sentient Chinese Marxist historical materialist. Xi proudly sees himself as a Marxist leading Communist China, even as he positions himself as the putative leader of globalization. Axios' Steve LeVine writes: Alibaba, the Chinese e-commerce gargantuan, says it isn't in a race with Amazon for U.S. customers, but that it's eager to take U.S. merchandise to its 550 million customers in China. Why it matters: American politicians and technologists are unusually sensitive to what's often perceived as China horning in on American customers, markets and tech. But they may be missing a different game — using an elaborately built system, Alibaba is linking U.S. merchants directly to millions of Chinese customers, bypassing Amazon and other American platforms and becoming an essential way station to the Chinese market. 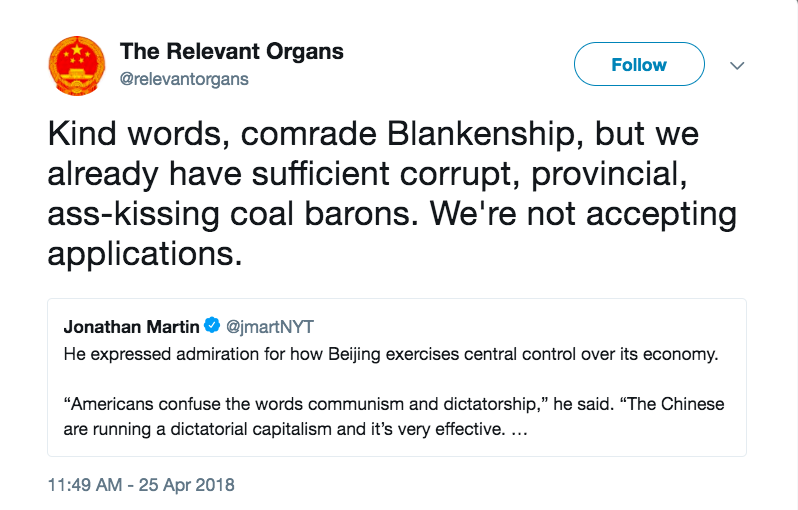 The New York Times has a bonkers story on coal baron, convicted felon and GOP Senate candidate Don Blankenship. “I’m actually considering moving to China or somewhere and being more like George Washington if I can get citizenship,” he said. “I can probably get citizenship in India. I’d rather be in China.”..
ChinaFile Conversation - Does China Want the Koreas to Reconcile?